Nothing says summer like fresh basil in the garden. My basil is just starting to come to fruition and I should have a LOT of it very soon. Of course the best thing for basil is fresh pesto. I love it on simple pasta with nothing else. Tonight I was looking for a quick meal and penne with pesto was just the thing to satisfy me. I threw in some fresh spinach too. I don’t usually do this but tonight I wanted a more hearty green pesto full of nutritious greens. My only problem this evening is that I ran out of parmigiano reggiano. I know – sacrilege! But it happened. The pesto was good but it just wasn’t quite right without it. 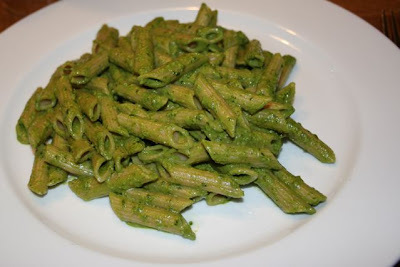 For this pesto I used a couple heaping handfuls of fresh picked basil, a handful of fresh baby spinach leaves, 3 cloves of garlic, the juice of half a lemon, a half cup of walnuts (pine nuts are also traditionally used), salt, pepper, and olive oil – maybe 3 tablespoons. I threw it all in the blender except for the olive oil which was drizzled in until the consistency was just right. This was simply poured over the hot cooked pasta and it was mixed up and enjoyed! Ah, Pesto! 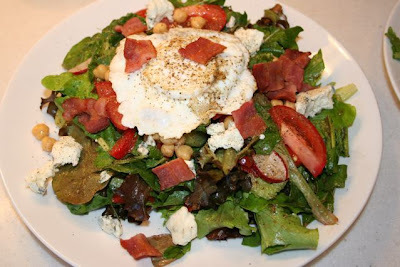 Of course I love to cook (hence the blog) and I love exotic ingredients from around the world. 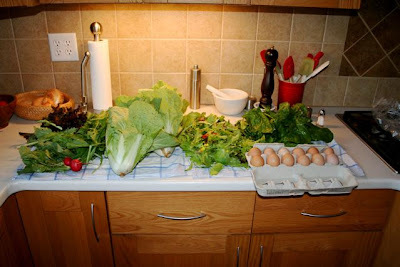 But our family also tries to support local food producers as much as we possibly can. 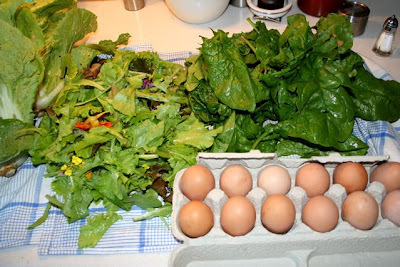 That means getting locally grown produce from our CSA and from the area farmer’s markets. We also buy our beef one cow at a time. Well, we usually split a whole cow purchase with a friend so we get half a cow at a time. This is usually about 300 pounds of meat after processing. A half a cow will usually last our family about a year and a half. We don’t eat beef every day. 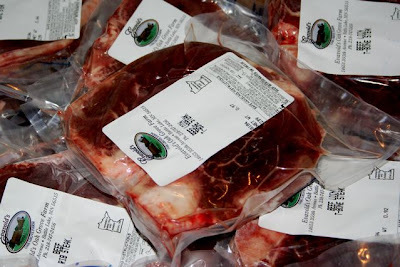 We were getting our beef from a North Dakota farmer in the past but this year we bought from Evavold’s Oak Grove Farm across the river in Battle Lake, Minnesota. The cows are pasture raised and spend most of their life grazing on grass. During the winter months they are fed corn silage. They are natural without added hormones or unnatural supplements. We think this is the best of both worlds. Grass fed beef produces meat with a higher amount of omega-3 fatty acids but sometimes leads to leaner, less flavorful meat. On the other hand, cows that are fed a grain based diet have great tasting meat but almost no healthy omega-3 fats. The combination of feeding at Evavold’s should provide just the right balance of healthy and good tasting meat. The cows are humanely slaughtered and hung for two weeks before being processed at J & B Meats in Barnseville, MN. Another reason we like to buy local beef a cow at a time is because the meat is processed from a single cow and not mixed with hundreds of other animals in a large processing facility. I believe this tremendously reduces the risk of salmonella or other nasty bacteria contaminating the final product. I feel better about cooking my burgers medium rare when it is from a single cow. 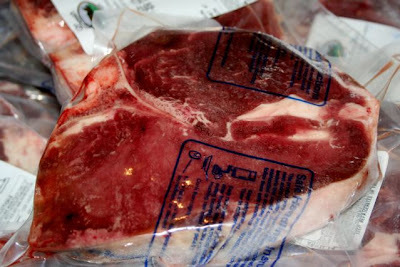 All the meat is vacuum packed and frozen so it stays fresh and tasty for a very long time. 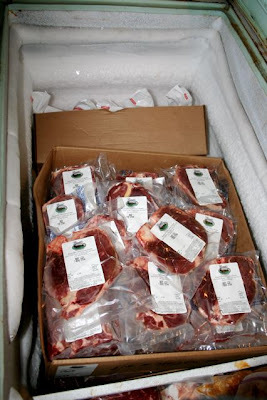 Our recent half cow purchase gave us many different cuts of meat including ribeye steaks, T-bones, all kinds of roasts, about 80 pounds of ground beef, and various other cuts. I even requested the oxtails which usually don’t come with the cow and are nearly impossible to find in our local stores. The best part about all of this? It only cost us about $2.60 per pound for a product that is exponentially better than you can get in the grocery store. They even drove it up and delivered it to our house for free. 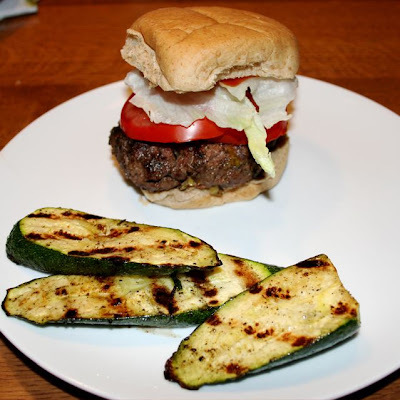 When it’s too hot to fire up the kitchen I opt for easy to prepare food on the grill outside. Nothing can beat a grilled burger. This one had some extra flavor though. I mixed into the meat some chopped up pepperoncinis, garlic powder, onion powder, salt, pepper and some dijon mustard. They were flavorful and juicy. I just love Indian food and especially love the cuisine from South India. I don’t make Indian food that often but I am often inspired by the wonderful spices and flavors of the Indian subcontinent to flavor every day food. I toss curry powder into my tuna salad. I add asafoetida to my chili. I mix hot spicy Indian lime pickle to my mashed potatoes. The flavors just make your mouth sing. 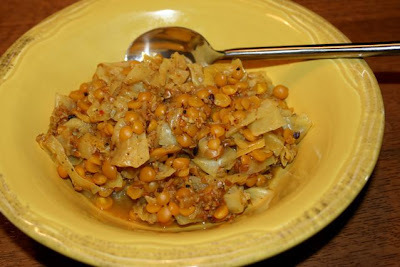 Anyway, I was rummaging through my cupboards looking for something to make for dinner with dal on my mind and I found my container of yellow split peas that I picked up at our local Indian market. I guess I am all out of dal. But these were just the thing I needed to create a vegetarian dish that was fulfilling and tasty. Also on the major ingredient list was cabbage and some coarse bulgar wheat. Yes, I know – not really traditional Indian, but the flavors and textures were good. I didn’t measure anything exactly but I’ll try to describe how I made this dish and what went into it. I started by heating a large heavy bottomed pot and added some olive oil. Ghee would have been better but olive oil is healthier. The first thing to do was to fry a bit of urid dal and mustard seeds in the hot oil. The mustard seeds pop like popcorn, so you need to put a lid on it. Careful not to let it burn. The urid dal gives small little crunchy bites in the dish. I would guess I added about a tbsp of urid dal and not quite a tsp of mustard seeds. As soon as the mustard popped I added a chopped onion along with lots of chopped garlic and ginger. This was cooked for a few minutes until the onions began to soften. I then added about 1.5 cups or so (a couple handfuls?) of yellow split peas to the pot along with a spice mixture. Again, I didn’t measure but I’ll tell you what I added. I had ground up some whole spices in the coffee grinder that I keep just for spices. Into that went a couple of cinnamon sticks, about 4 pods of cardamon, a couple tsp of corriander seeds, a couple tsp of cumin seeds, a tsp of black peppercorns. I also added some Madras curry powder to the pot along with a few dashes of asafoetida powder, some tumeric and some red chili powder. Oh, I also season with salt along the way. Basically add as much of any ingredient as you like to taste. In a dish that cooks for a long time it is important to add a lot of spice to flavor everything well. After cooking for just a minute the spices started emitting a wonderful aroma. I added about 6 cups of water and a few dashes of rice vinegar. Lemon juice would have been nice but I didn’t have any on hand. The split peas were cooked for about 20-30 minutes until they started to soften. 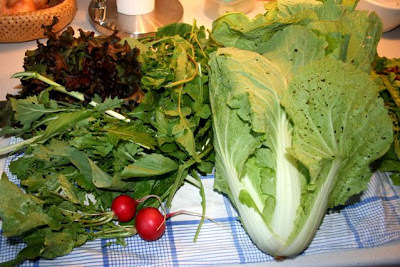 I added a cup of coarse bulgar wheat to the pot along with a whole head of cabbage that had been chopped up. This was covered and cooked for another 20 minutes or so, stirring every now and then, until the cabbage was all wilted down and the split peas had a nice cooked but not mushy texture. The bulgar absorbed nearly all of the liquid so this was not a soupy dish. 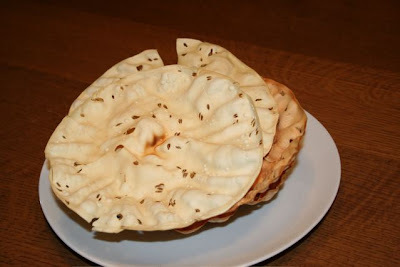 Along with the meal I served some poppadom – an Indian style thin crispy cracker like bread. You can by them in dried uncooked rounds in your local Indian grocery. I used to fire them quickly on the grill or even on my stove top but on the advice of a good Indian friend, these can be done to perfection in the microwave. Just nuke them for about 1 minute and they crisp up nicely.